The defense of the Philadelphia Eagles was the key factor in their major upset victory on Sunday. “Momma always said the Philadelphia Eagles were like a box of chocolates, you never know what you’re gonna get.” Forrest Gump was quoted in saying something like that. After exploding at the start of the season for three straight victories, the Eagles dropped two straight games in ugly fashion. Sunday’s game against the then-undefeated Minnesota Vikings seemed like a sure loss. Well, not exactly. 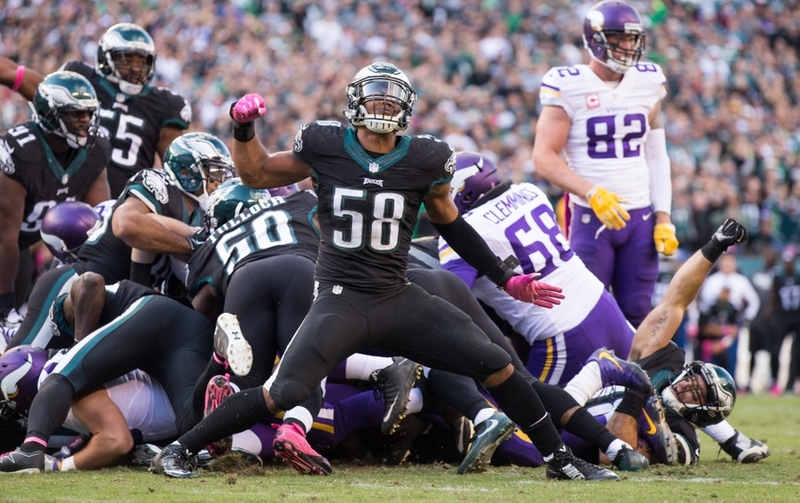 The Eagles pulled out a 21-10 upset victory in which the defense played in dominant fashion. Jordan Hicks, Brandon Graham, Connor Barwin, and Rodney McLeod all turned in their best individual performances of the season. Each fueled one of the most impressive defensive showings in recent memory. They forced turnovers, shut down the Vikings run game and helped carry their team to the promise land. Hicks was absolutely phenomenal on Sunday afternoon. The second-year player had a great rookie season before his injury. This season he hasn’t quite played up to the level that he did last year, but he’s been solid in every game so far. In this one, Hicks flashed signs of brilliance all day long. He was better than solid, he was exceptional. He had an impact on several plays. On one in particular, he ran laterally to the sideline to make a tackle on an opposing running back, resulting in a loss. He exploded through the holes, and when it was all said and done, he had tallied 11 tackles, including one sack, three tackles for a loss, one hit on the quarterback, and two passes defensed. Now thats one heck of a stat line. Graham aka “Graham Sacker” had the biggest impact of anyone in this game, with the exception of maybe Rodney McLeod. Graham forced a fumble, had a sack and hit Sam Bradford five times. He’d finish the game with three tackles. The numbers don’t even indicate how good he was. The veteran defensive end caused disruption on seemingly every play. He’s been tremendous all year, and he’s only getting better. Barwin made the most of his playing time today. Last week, the Eagles coaches stated that they wanted to reduce Barwin’s snaps in order to keep the veteran fresh. That plan worked to the tune of a forced fumble, a sack, and four tackles. This game was an encouraging fans watching and for Barwin. He’s been seemingly invisible at times during this season. McLeod is just a playmaker. He’s having an all-pro season thus far, and he produced his best game yet on Sunday. Clearly the team’s biggest free-agent acquisition in the off-season, McLeod hasn’t disappointed. He’s everything you would want your strong safety to be. In this game, McLeod chipped in with seven tackles, one pass defensed, one sack, one interception, and one forced fumble. The interception came in the end zone when the previously mentioned Graham forced an errant throw from Bradford. The star safety’s strip sack came courtesy of a blitz drawn up by defensive coordinator Jim Schwartz. On Sunday, the Eagles proved to be a football team that’s going to be unpredictable all year. Inconsistency rarely leads to any type of success, but the “Bird Gang” now sports a 4-2 record with an important divisional game on deck. The Eagles play in primetime next Sunday against the Dallas Cowboys. That one should be interesting.